Normally in TV scheduling network keep their powder dry, preferring to not let the opposition know their every move. Nine has sometimes been notorious for keeping dates and even review copies under wraps until the last minute -occasionally even from publicists…. With more than a month until ratings begin it has shown its hand for Australia’s Got Talent, confirmed as launching Monday February 1st. The date is the day after the Australian Open final meaning it is also the likely premiere date for My Kitchen Rules while TEN is yet to indicate a launch for I’m a Celebrity Get Me Out of Here. Update: Seven has on air promos for MKR, Home and Away, The Chase as Feb 1. Whilst Nine has not confirmed the timeslot, 7:30pm would be the likely start time. Whether it strips auditions across the week is also unclear. There’s a lot riding on it, given it’s essential viewers connect with talent show acts from audition stage. Australia’s Got Talent, the show that celebrates the unique and brilliant from all walks of life, will premiere on Monday, February 1, on Channel Nine. 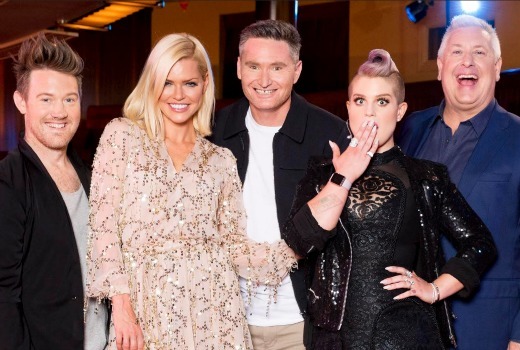 Judges Kelly Osbourne, Ian “Dicko” Dickson, Eddie Perfect and Sophie Monk will be joined by host Dave Hughes in a search to discover Australia’s most remarkable new talent. Auditions will feature a huge variety of acts including dance troupes, jugglers, magicians, incredible animals and death-defying stunts. No act is too big, small or outrageous for the AGT stage. In an exciting AGT first, each of the judges will have one shot at the new Golden Buzzer that will put an act straight through to the semi-finals. And in another twist, this season will see the introduction of a viewer-voted Wildcard to send one lucky performer directly to the Grand Finale. The Got Talent format, co-owned by FremantleMedia and Syco Entertainment globally, holds the Guinness World Records title for the highest number of adaptations, making it officially the world’s most successful reality TV format. Since 2006 it has expanded to 183 countries with more than 500 million viewers. Australia’s Got Talent is a FremantleMedia Australia production in association with ZigZagTV for the Nine Network. Monday February 1st on Nine. He might be a good bloke but Dave Hughes’ voice should preclude him from anything other than his annoying stand up acts. I agree with the majority on here that Eddie Perfect would’ve been best suited as host then a judge. David Campbell maybe would’ve been a good choice as a judge. I’m in that camp as well, Eddie would be better as host, I love Hughie but he’s overexposed and Eddie is more edgy than Dave. David Campbell would be very good as a judge – he certainly has more credibility than Kelly Osbourne to judge talent with his success in the musical arena. I wish that Darren Hayes would be a judge in one of the singing shows, he is massively underrated. He mentored on The Voice but he should have his own chair. Jon Stevens would do well also but I guess a lot of the kiddos wouldn’t know who he is. i totally with u. which 4 people would you pick as a judge and which person as host. The ad 9 is showing for AGT makes me want to throw something at the TV. The guy looks like a stunned mullet. He’s obviously a paid actor. He just looks ridiculous. Especially when everyone behind him has a face like a statue! Memo Channel 9- if you’re going to make out that something is jaw dropping…make everyone do it! The mix seems a little odd here – I almost think that. Dave Hughes would have been better as a judge and perhaps Eddie and Sophie as joint hosts. 9 have gone for a simpler approach to AGT but I think it’s important to remember their last series rated well – it was just hindered slightly by putting it up directly against X Factor. I’ll be surprised if it manages to get to 1m. Seven started promoting Feb 1 for MKR on New Years Eve. Nine simply counteracted come Mon 4th when they were back in the office. Great now we’ll be bombarded with even more newspaper stories about Sophie Monk. as for Kelly Osbourne,why the heck have they dragged her out ? She’s got no talent,is just bitchy and is only known because of her old man and that bloody awful reality show the family had. Some years ago when Seven announced AGT a journo asked me who should host. I said “There’s this triple threat guy named Eddie Perfect who is the living example of the title.” They hadn’t heard of him and didn’t run my quote. Irony. MKR… another series where we find the villan, everyone hates contestant… the loveable goofy arent they adorable contestents… the fence sitters the ones that wants everyone to like them and the outstanding stars… AGT almost exactly the same … reading into this… Netflix wins with gripping drama and well made docs. So over reality/”unscripted” but suggest you say this TV….. sigh…. This launch is surprising because Nine usually waits until after Easter to launch their new season shows so they won’t be interrupted by the Easter non-ratings period. Nobody has forgotten the Ugly Betty disaster when Seven launched the show at the start of the year and it became an instant hit before Seven took it off over Easter, and when they brought it back the viewers had gone and never returned. Excess Baggage was another early year launch. Strictly speaking AGT is not new in this regard anyway. There’s 7 weeks from Feb 1 until Easter non-ratings this year – it could be possible that AGT will wrap up within that time and have to continue after Easter. I see three reasons, all on the right hand side, in the pic., for now watching this. Welcome back MCR. Don’t fiddle with it. Keep the 2015 format. Bit of a spoiler 7 showing H&A promos – Brax is back, is shot, is on life support. Well, yes, but that could be from a July ep., being 7. One little typo, one big mistake. “now” ?? Should read “not”!! AGT v MKR. A nail in the coffin. So a commercial free to air network gives plenty of advance notice on a reality start date. Unfortunately the same courtesy doesn’t seem to extend to drama start dates. Even when a network has plenty of advance notice on the start date of an overseas drama for some reason the Australian start date remains extra top secret. Surprised it isn’t Block Season 2146 starting out the year. Putting this up against MKR is suicide. It will tank. I reckon IACGMOOH may even beat it. Possibly this show will get beaten by MKR, IACGMOOH. Hope AGT will be the last ever.